Born: Bristol, 23 Jan 1824. Died: Ramsgate, 10 Feb 1868. Pratten was a self taught flautist and according to Rockstro the only lesson he ever received was from his elder brother, Frederick, who later became a noted Double Bass player. He first appeared before the public as a soloist, giving concerts in Bath and Bristol from the age of twelve. 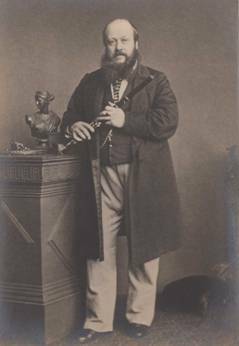 He then went on to secure a place in the orchestra at the Theatre Royal, Dublin before settling in London where he held the post of first flute at the Theatre Royal, Covent Garden from January 1845. The following month he made his first appearance in London as a soloist playing Nicholson’s Fantasia on an Air from Nina, at a ‘Monster Concert’ given at Covent Garden Theatre. Between August 1846 and June 1847, Pratten toured the principal cities of Europe under the sponsorship of Sir Warwick Hele Tonkin. He was received enthusiastically by audiences and critics alike gaining for himself a fine reputation. Soon after returning to England he took up Siccama’s flute and put aside his 8-keyed Rudall & Rose instrument. 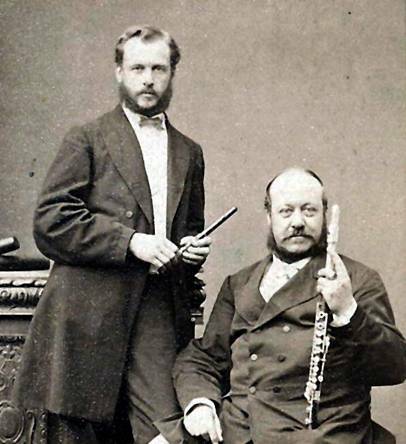 In 1852 he was appointed first flute at the Royal Italian Opera, Covent Garden and succeeded Richardson on joining Jullien’s band where he became a chief attraction at the Promenade Concerts. That same year he began designing his own flutes and from about 1856 had them made by Boosey & Co. Other appointments at this time included concerts of the Philharmonic and Sacred Harmonic Societies. In September 1854 Pratten married Catharina Pelzer, a celebrated guitarist, a youthful prodigy like himself, who began giving solo concerts at the age of nine. Pratten was composer of numerous flute pieces, studies for the Siccama flute, scales and exercises for his own ‘perfected flute’ and tutors published by Boosey & Co. and E. Ashdown. He became suddenly ill whilst playing the obbligato to “O rest in the Lord” (Elijah) at Exeter Hall in November 1867. He was able to play to the end of the item but then had to leave the orchestra. It proved to be his last concert.